How can people and services reduce risks and costs? Speaker 1: Health is an important part of life. It impacts relationships, careers, how we reach our goals and dreams. Managing our health should be simple and effective, with smart, seamless experiences that connect individuals to the right care and support. By drawing from broad data sets that create a foundation for deep, insightful analysis, applying experience and expertise to deliver care plans that improve health, providing personalized services targeted to the individual. Addressing physical, mental and financial needs, reducing costs and delivering healthier outcomes. By meeting each individual where they are in their healthcare journey, by helping them to know how to approach healthcare challenges, what issue to tackle first, and where to go for help. People are empowered to take ownership of their health, and good things happen. Speaker 1: When the healthcare system is easier to navigate, barriers collapse, and care becomes accessible. As clinicians, employers, health plans and individuals are guided towards the next best action, costs decline and results improve. 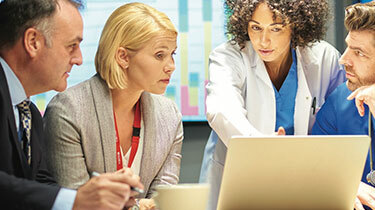 At the forefront of personalized connected healthcare is Optum, so people can focus on what matters most. We can engage your unique population using insights from data and analytics to help lower costs and improve outcomes. Simplify navigation with 24/7 personalized support. Connect individuals to the right care, at the right time, in the right setting. Reduce complexity and streamline care for better outcomes. Apply financial expertise across the health care system. Gain strategic insights to improve your bottom line. Improve productivity, reduce risks and lower costs. Explore how Optum Health Care Advisor personalizes the health care experience. Optum Kidney Resource Services help members navigate the unique challenges they face. Discover how Optum delivers effective consumer engagement to reduce population health risks and lower costs. 1. Optum consumer analytics comparing Q12016 to Q12018. 2. Optum national behavioral provider network count as of July 2018; Janowski, August 2018. 3. As of November, 2018.